5 Comments on Answered: Can you describe a square with 1 equation? Answered: Can you describe a square with 1 equation? First, I want to say how humbled I am by the people who read this blog. You are awesome. You might want to read the original post where the question came from. So, can you describe a square with only 1 equation? 3 readers gave their opinions, and they are all correct (meaning they’re smarter than me). I will present their answers first, then present my engineer friend’s answer, and then mine (which is worthless, and didn’t work out the way I wanted). That actually took me a while to understand. And is actually the more complicated answer. But it’s exactly the answer my friend was looking for, which is an upright square. We’ll assume the centre of the square to be the origin. 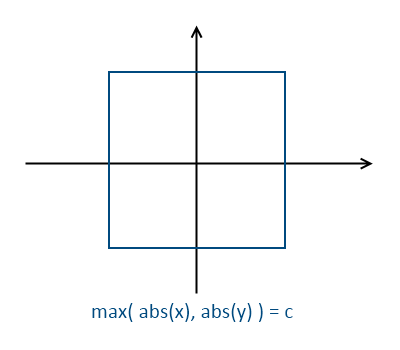 The absolute function reduces the working Cartesian plane to just the first quadrant (if it works in the first quadrant, it works in the other quadrants). 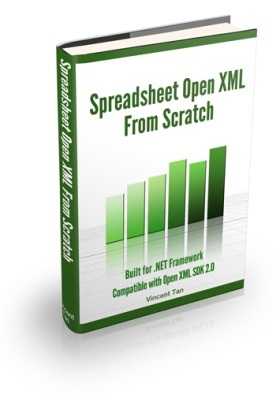 The maximum function ensures that either the x-value or y-value (or both) is equal to c (half the width of the square). What if the absolute function is not in action? Then if -c < x < c, then y must be either -c or c (because of the maximum function). Therefore there are 2 horizontal parallel lines. Similarly vice versa, creating 2 vertical parallel lines. And there’s your square. This is brilliant. which is the L1 norm. The norm of a matrix is the magnitude of the matrix. In this case, the matrix is actually a 2 dimensional vector. The pipe character | surrounding the x and y values mean we’re taking the absolute value. This one is interesting. 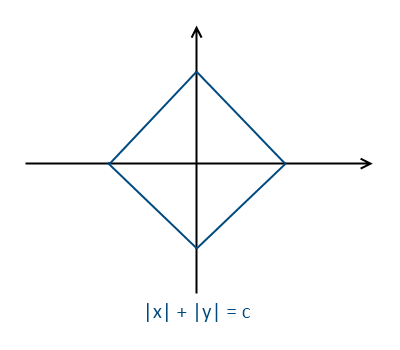 It means that the larger the value of x, the smaller y has to be to compensate, so that the sum of x and y is C. This see-sawing effect created a triangular shape for each quadrant. Which when formed together, becomes a square (tilt your head 45 degrees to see it better). This equation is equivalent to the L1 norm form. Chris also pointed out that the squares formed by the previous 2 equations differ from each other by a rotation of PI/4 (radians) or 45 degrees. 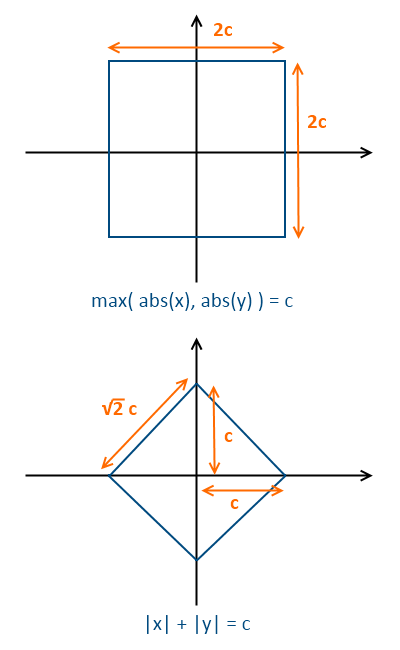 The square formed by the max-abs way has a width of 2c. 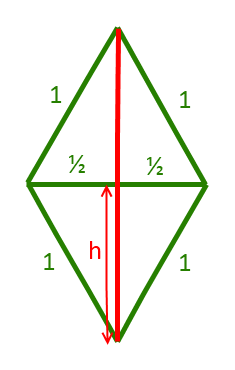 The square formed by the L1 norm way has a width of sqrt(2)*c.
Or basically x and y to the power of a sufficiently large number. The result is not exactly a square, but it looks sufficiently like a square. And that was his point. That engineers take “good enough” and practicality as priority. If a wooden beam is in the correct position, and is supporting the weight of the roof, who cares if it’s 1 nanometre off the intended position? You’ll see a square with round edges. Actually x^100 + y^100 = 1 gives a nice square plot. To my friend, that’s a good enough square. He posed the question to me for an analytical answer, because even he knows his answer wasn’t exact. And my (worthless excuse of an) answer? I hit upon the idea of starting with a circle. Then morphing it somehow into a square. The idea came from a super equation that can describe a cube or sphere or some other 3D object. I can’t find it anymore… I saw the equation when I was doing research on the demoscene. You vary a parameter t, and you get different 3D objects. That’s neat. to work… That was for y. I had a correspondingly elaborate term for x. How am I going to draw a square in the polar coordinate plane when I basically only had theta to work with? Everything will be circular. So there you have it, 2 equations to describing a square. And 1 equation that creates a result that looks like a square, which for most purposes and intents may be regarded as a square. We have 1 upright square, and 1 square that’s tilted 45 degrees. My friend wanted to know if there’s an equation that creates a square in any rotational orientation. I don’t believe there’s one, so please don’t bother to try. It’ll just waste your brain cells. But you’re welcome to try it as an intellectual exercise. 4 Comments on Quiz: Can you describe a square with 1 equation? Quiz: Can you describe a square with 1 equation? I was hanging out with my friends, and somehow the topics wandered into something that prompted a mischievous grin from one of the guys. “Eh, I have a maths problem for you.” He could probably blind someone with that playful twinkle in his eye. “What?” My mind was already racing to solve the problem. “Just take it as a square in the 2D Cartesian plane. The centre of the square will be at the origin (0,0) to simplify the equation.” He seemed delighted to have stumped me. I asked if there were any boundary conditions. No. Was the equation elegant? As in fairly simple when looked at, no mangling of terms. He gave it a second, and… yes, it was elegant. Our conversations left this topic. But my brain was subconsciously still working on it. Then I blurted, “I think I solved it.” I described my way of thinking, and he said that’s along the correct line of thought. Then he just gave me the answer. Yes, I agree. The answer will probably ruffle the feathers of the math purists. As of this writing, I have yet to come up with the analytical formula of an equation to describe a square. I will post my findings, and my friend’s answer in a week’s time. You are encouraged to come up with your own solution. Post in the comments. Better yet, write about it in your blog. Tell your friends about it. Show them how awesomely clever you are. Can you describe a square with 1 equation? Update: Find out the answer. 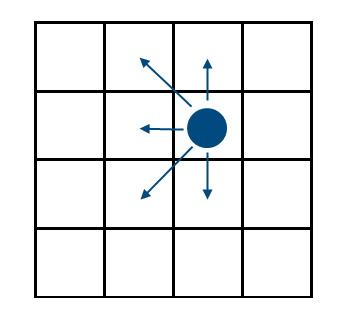 Most traditional board games use squares to segregate space. Space is divided evenly. Lines are easy to draw. Everything is structured. Bliss. 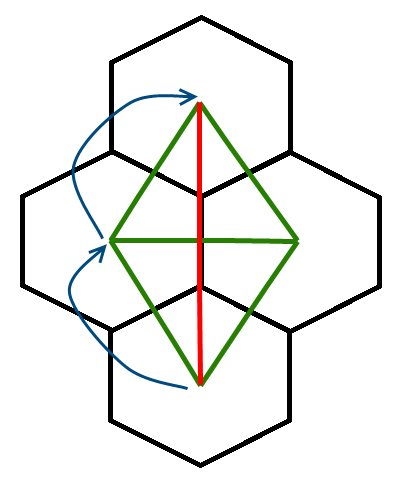 Except that when you need to move to a diagonal square, you need to move 2 squares instead of √2 squares. Wait, a non-integer movement? That cannot be tracked! Dungeons & Dragons 4th Edition (a tabletop RPG with physical positional tracking) state that a diagonal square movement costs the same as a perpendicular square movement. Meaning you just move 1 square to reach that diagonal square. This also has its problems. I talked about this briefly on my other blog, but didn’t go into the math details. So the blue dot is you, the red dot is the enemy, and the brown dot is where the enemy is pushed to. The distance between you and the enemy is (do the Pythagoras thing) 2√2 (approx 2.8284). The distance between you and the final position of the enemy is √10 (approx 3.1623). Sure √10 is greater than 2√2, so mathematically speaking, the enemy is moving away from you. But common sense is telling me otherwise, because the direction of the push emanates from you. Anyway, to combat the shortcomings of the square terrain, there’s the hexagonal terrain. Under this division of space, all adjacent spots are equidistant to your position. Well, it still has its problems. 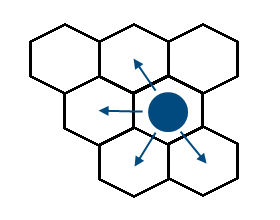 You still need 2 hexagons of movement to reach the first hexagon directly above you. Therefore, the actual distance is 2h which is √3 (approx 1.7321). Not quite 2 hexagons, is it? This is part of the reason why, when games are created on computers, that these limitations disappear. 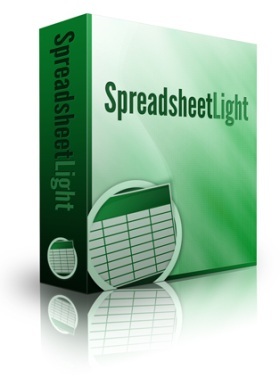 Because computers can do the distance calculations and tracking. 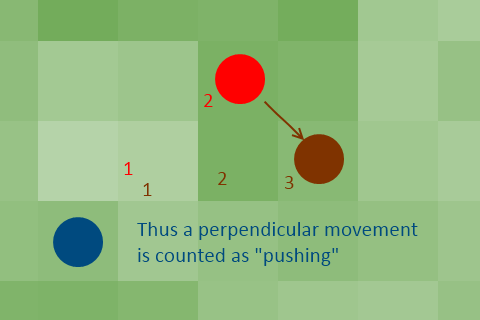 You can move in any direction, for any amount of units of movement, as long as you do not hit anything. And that is called collision detection.